Office 365 Search has been improved a lot recently. While “classic search” is in a kind of “frozen” state, the Microsoft-Graph -driven “modern search” gets better and better. It is very clear where all the effort of Microsoft’s Search Team go to. answers directly from search (rather than “results”). 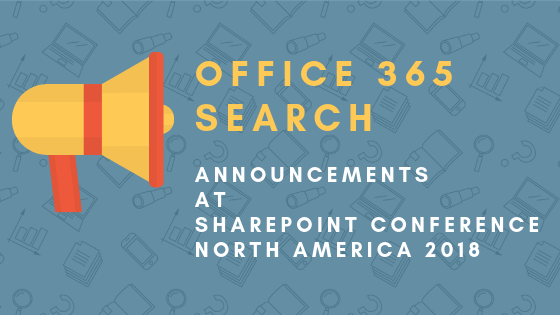 Jump to 1:03 for Naomi’s Office 365 search announcements. Today, there are so many search experiences in Office 365, it’s hard to even count them. Users are confused about it. Naomi hasn’t made any explicit announcement about it, but used the expression “consistent search experience” several times. So if we read correctly between the lines, hopefully this means consistency is a goal of Microsoft these days. We can hope the confusion of the current too-many-different-searches experience will be gone, and the users can really have a consistent way of searching (and finding!) the content or person they need. Side note: Note what Naomi says at 1:03:56: “Bing for Business… that’s one of our newest search experiences” – You see? I understand the values Bing for Business brings in, but to be honest, we don’t need any more “new search experiences”. What the users need is consistency. The SharePoint mobile app gets a new “Find” tab with personalized suggestions, similar to the modern experience (see below). According to Naomi’s demo, it’ll suggest documents as well as sites, but not only that. It will provide answers, rather than “results” only. What does it mean? With the rise of cognitive technologies and intelligent search, the user’s intent can be found out. Just try it yourself: go to Google, and do a search for “Antwerp to Brussels train“. In the classic “ten blue lines” search experience it would provide you links to some related results. Today, Google provides you answer to your question: a map showing the railway between Antwerp and Brussels, but also the schedule of the trains (and delays, too, if any). Moreover, if you do the same search at the railway station in Antwerp, it’ll also show you which platform to go to catch the next train. You get a similar experience if you want to know currency rates or exchange between metric and imperial units, etc. Google gives your answers – and so will do the upcoming modern Office 365 search. Naomi demonstrated it in the SharePoint mobile app but probably it will come in the browser, too. She did a search for “refunds” and instantly got the company’s refund policy above the search results: the users definitely need the policy itself in most cases, and not the documents or sites containing the policy, so it’ll be a really big improvement. The promise is that this feature will be intelligent: extracts “answers” from content automatically. However, it raises some questions and new concerns as well. First of all, this feature was demoed only in the mobile app, we haven’t seen it in the browser. Other questions are mostly about how it will work: what if I want to add an “answer” manually? What if I want to alter what is automatically extracted? Maybe it is not the most accurate answer but with some human curation, it can be… How will this feature know what is considered to be an authoritative “answer”? – There are still many questions which we don’t know the answers yet, but this will be a feature with significant value, indeed. You can add your own suggestions by importing them on the tenant administration. In the future, we’ll be able to feed the modern suggestion list from custom resources, too. The example Naomi mentioned at the SharePoint Conference was a SharePoint list: users with the proper privileges can edit the suggestion values directly in a list, no need to involve an administrator if an update is needed. This feature can be very useful for organizations who want to keep the governance of search suggestion simple. I am really looking forward to seeing it in action – and also, seeing what other sources will be available besides SharePoint lists. Currently, there is no way to customize the modern search results – despite it’s a common need. In classic search, we can use features like Result Types and Display Templates. In modern search, we will be able to define custom entities and customize their display (see the screenshot below). How this will be possible is not known yet (publicly), but this new feature is definitely a must. In classic search, we can create custom search result pages, and also “tabs” in the search center – these are called search verticals. In Office 365 modern search, however, currently it is not possible to create or customize the out-of-the-box verticals (which vary app to app). On the screenshot below you can see that soon we’ll be able to add our own verticals to the modern search pages, too (“Travel Programs” on the screenshot). Note that Naomi referred to these verticals as “search refiners”. However, these are what we know as “search tabs” or “search verticals” today, and not the on-page search facets known as “refiners” in SharePoint and Office 365. The naming that was used at SPC18 might be confusing – but this feature is also must-have indeed. If you take a look at the screenshot above again, you can see the “filters” on the right side are also custom properties (location, program manager). In the classic world, these search refiners can be found on the left side – now they’re placed to the right in modern search, but even more importantly: the filters will be also customizable! I am really looking forward to seeing it in action soon! Why do these announcements matter? These announcements really gave me hope last week. Microsoft has invested a lot into Microsoft Graph and “modern” experiences recently – but has not invested into classic search at all. Obviously, more and more people got concerned about it, and guesses were made whether Microsoft is getting out of the search business OR they’re shifting the focus to the modern, Graph-driven search. Now you can see the answer. …but there are some concerns and questions, too! Yes, modern search in Office 365 is rich and great even today, but it’s still far away from the freedom and flexibility we have in classic search (and classic search-driven applications). The announcements made last week are definitely a good sign of what’s coming. However, still there are some concerns, mostly about the questions of “how” and “when”. How will these customizations work? Do we have to do coding (like SPFx)? What these customizations exactly make possible? Why the “custom entities” are called “entities”? Will the concept be totally different to result types and display templates of classic search? Why? How? Why the verticals are called “refiners”, and the refiners are called “filters”? Does it mean any changes in the concepts, or it’s just simply a naming confusion? And most importantly: what the “consistent search experience” that Naomi has mentioned will mean? Can we hope a search UI consolidation across all the experiences? – I truly hope so. What do you think? Are you excited about these changes? Or worried? Why? – Please let me know in the comments below. PreviousHow to mess up Search in five easy steps? Delve Is Missing On My Tenant. What Should I Do? is there any update about those anoucements ? Any update on the filters / refiners? I searched the roadmap and do not find anything that looks like this announcement. No news yet, I’ll write about it on this blog as soon as I can hear anything. I am very frustrated that there is no official documentation that describes all of the search functionality that does not work in the modern search experience. My customers are trying to create Query Rules to Promote results only to find out that it doesn’t work. We wasted many hours thinking we were doing something wrong before we realized what was happening. When software does not perform as described in the documentation, this is just a big set of bugs. I am sorry for your bad experience. I’ll do my best to create a “modern search” detailed documentation soon.